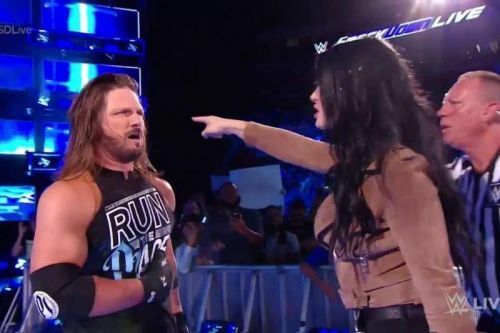 This week's SmackDown proved a disappointing failure to live up to its potential. While all of the main feuds on the blue brand are hot, this episode certainly wasn't. While it was certainly better than Raw, this week's SmackDown demonstrated that the show is now resting on its laurels as it builds to Hell in a Cell, seemingly figuring that the programs are hot enough, so why bother putting in more effort? The result was the disappointing episode we got last night. Who got the most and least from last night's show? After doing a good job of protecting Andrade "Cien" Almas last week, one of the brightest rising stars in the company and his manager Zelina Vega were sacrificed not once, but two times, on the altar of a Brie Bella whose return has already overstayed its welcome. While Bryan's program with the Miz is hot, the involvement of their wives has cooled it off from last month, and the sooner those two are gone from the programming, the better. Sadly, that likely won't be until after Evolution, which is looking more and more like a glorified PR stunt than an actual worthy show to watch. Almas losing to a top star like Bryan isn't deadly by itself, but coming back afterward at the end of the show just so he and Vega can be used as a plot device to send a message to Miz and Maryse? That was terrible booking. Almas looked like he was on the upswing in August, but his post-SummerSlam days haven't been so bright. Hopefully, he'll have something better to do soon. Speaking of...Shinsuke Nakamura wasn't seen last night, despite being United States Champion. Sure, it would be heel vs. heel, but can't something be made of a feud between them?